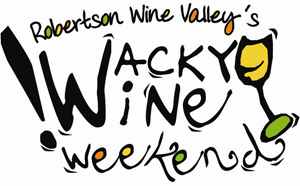 The 5th Wacky Wine Weekend held in the Robertson/McGregor/Ashton/Bonnievale region of the Western Cape from the 6th-8th June was once again a resounding success – the atmosphere completely untempered by the severe cold and rainy weather. By all accounts attendance was at an alltime high, as most certainly were the sales of wine bottles. Your Wacky Wine Weekend passport costs R40, and this includes and enormous tasting glass (not one of those little tulip varieties). It must be purchased at your first stop, and stays with you throughout the weekend. There’s a certain sense of cameraderie walking amongst similar-minded people – all with their large glass up in the air. All sorts of activities were on offer – from oysters at Bon Courage, and a Sparkling ‘Blush’ at Van Loveren, to big screen TV’s broadcasting the rugby, to braaivleis, sushi and archery and a mountain bike funride. The children were also looked after with jumping castles and face-painting – to mention but a few. It once again lived up to its title as “the most unpretentious wine event” – and i’ll definitely be back next year. Roll on 2009!